TOKYO (Bloomberg) -- The defect in Takata Corp. airbags linked to four deaths in Honda cars opens the supplier to risk of losing business to rivals including Autoliv and Daicel in a crucial portion of the market for the safety devices. The market for airbag inflators -- the component at the root of deadly defects -- is likely to shift away from Takata to suppliers including Autoliv and Daicel, potentially allowing the two suppliers to control more than half the market by 2020 as Takata's share shrinks, said Scott Upham, an analyst who has followed airbags since they were first going into cars a quarter-century ago. Takata is vulnerable despite the difficulties automakers usually face in changing their choice of parts suppliers. Carmakers can swap out the inflators, which account for about 60 percent of the cost of the complete airbag system, even if they decide to stick with Takata for other parts of the device. "For the next five years, Takata is really going to take a beating," said Upham, president of Valient Market Research in Rochester, New York. Automakers are rushing to recall millions of cars to fix airbags that can inflate with too much force and fling metal at passengers. Honda, Takata's biggest customer, said it's verifying again its selection of the company's airbags over concerns about quality and supply. "We have seen some business coming our way as a result of this situation," Autoliv CEO Jan Carlson said on Wednesday during the company's quarterly earnings call. Mounting recalls by Honda, including callbacks announced on Wednesday for its Fit compact in Japan, spurred three-month pay cuts for President Takanobu Ito and other top executives. Takata's share of the global automotive airbag inflator market may shrink to about 11 percent by 2020 from 22 percent this year, according to estimates by Valient. Hideyuki Matsumoto, a spokesman for the airbag maker, said he couldn't confirm whether automakers are switching inflator suppliers. "We know it's going to be difficult to restore carmakers' trust, but we'll make the best effort to do so," Matsumoto said. 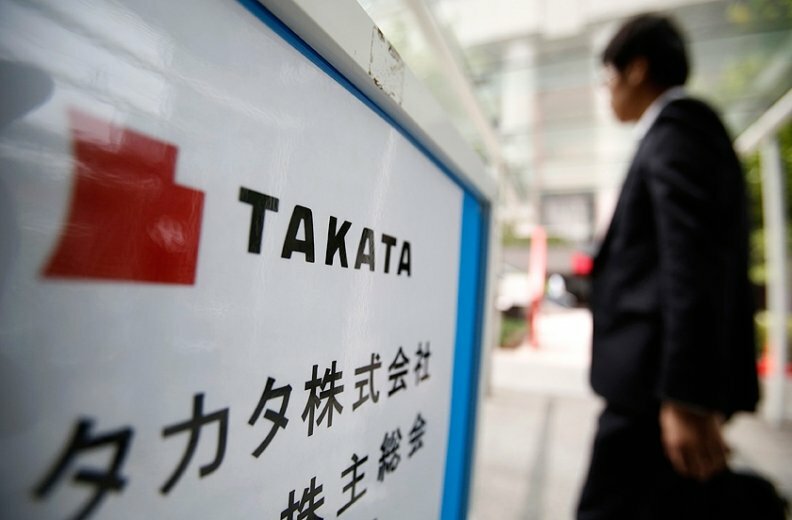 Takata issued its second statement in as many days on Wednesday to reiterate that it expects any additional charges related to airbag recalls would be small. Autoliv, the biggest maker of the inflators, may boost its share of the global market for the component to 28 percent by 2020 from 25 percent, while Daicel's share could jump to 24 percent from 16 percent, according to Valient's projections. Daicel, which already supplies some inflators to Takata's airbag systems, is targeting 30 percent market share for the component by 2020, said Masahiko Hirokawa, a company spokesman. The airbag inflator market is more diverse than that of the complete safety systems that use the component. The three leading module suppliers -- Autoliv, Takata and TRW Automotive Holdings Corp. -- account for about three-quarters of sales combined. The remainder is split by smaller companies including Japan's Toyoda Gosei Co. and Nihon Plast Co., according to estimates from Credit Suisse Group. Carmakers still get their supply of complete airbag systems from multiple suppliers, rather than from a single source. Honda already purchases more than 20 percent of driver side airbags from Autoliv and Nihon Plast, according to estimates from Morgan Stanley. Any change in suppliers made by automakers can be costly and typically require several years of lead time. That's due to challenges involved with designing systems to fit different models and passing extensive testing by carmakers to meet safety standards, said Steve Man, an auto analyst at Bloomberg Intelligence. "This is a very regulated component," said Man. "There's an approval process which could take a number of years before the carmaker will start buying that component from that supplier. That's why the switching cost is very high." The close relationship between Japanese partsmakers and carmakers, rooted in the tradition of "keiretsu" business culture, could provide some protection to Takata. A top Toyota Motor Corp. executive who played a crucial role in the carmaker's unintended acceleration recall crisis stressed its close relationships with suppliers and offered support. "They're doing what they're supposed to do: understand the root cause, and then learn from it and reflect and put countermeasures in place," Steve St. Angelo, head of Toyota's Latin American operations and former chief quality officer for North America, told reporters this week in Tokyo. Toyota will exhaust every effort to help suppliers first rather than "dump" them, St. Angelo said. "You have to take your lumps, do it quietly, and you're basically going to be punished for a period of time, but they will not throw you to the wolves," Upham said of the relationships between Japanese carmakers and their suppliers. "That's what's going to happen in Takata's case."